The measured width of all are the same. 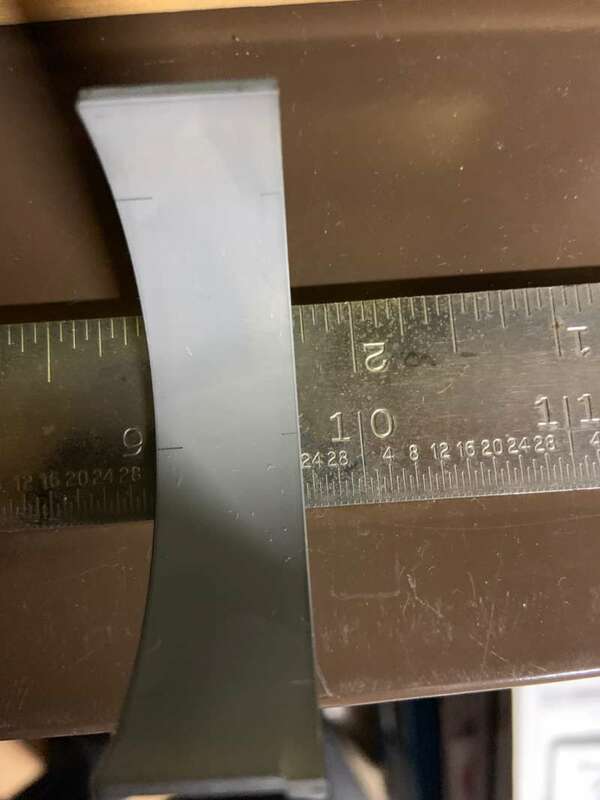 All measure between 0.793” - 0.794” = 20.14mm - 20.17mm. I placed each pair in an SC rod and they all line up evenly in the rod. Sorry I didn't take a picture of the bearing alignment in the rod but you can trust me on this. Here's how the error was discovered. Jon had asked me to take some pics of my various bearings with a measuring instrument on them, or installed in a rod. So before putting them in a rod, I took one and set it on a steel ruler. Ruler shows around 22/32" I plug that into my phone calculator and multiply by 25.4 mm per inch and get 17.46mm Wait......... 17? What????? THAT'S NOT 20MM!!!! So big apologies here to everyone for my measuring goof. All of my bearings are 0.69x" wide and therefore 17.5mm to 17.7mm. How did this happen? I misread my caliper because I see the 7 on the beam to the left and then simply add what I see on the dial. Well, the dial hasn't passed 0 yet. SO YOU'RE STILL IN THE 6 RANGE OF MEASUREMENT!!!! My error notwithstanding, it still doesn't explain why other people are experiencing bearings that don't align at their parting lines. So for additional comparison/beating this horse to death, I happen to have a 3.2 apart in my basement. I figured i'd take a look at those bearings since Dauner has problems with his 3.2 bearing alignment. 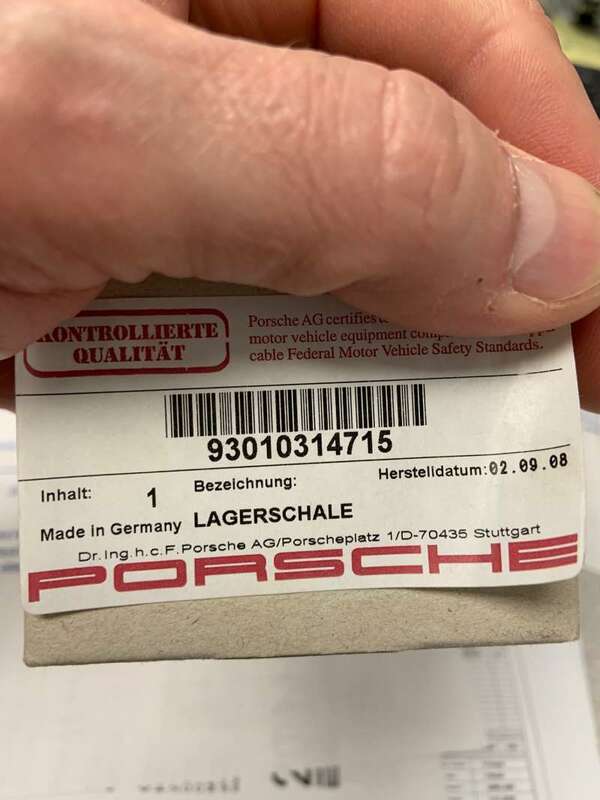 I took a look at my 3.2 bearings and here's some pictures of the old bearings in the rod and measured (you read the measurement- I can't be trusted..... ) and also some pics of the "new" bearings I got from Porsche dealer network. I got the "new" bearings February 2018. I'm quoting the word new because the date on the box is February of 2008, not 2018! Nope. Apparently they are all the same width. There seems to be some variation in the location of the notch in the rods leading to the misalignment but in the end I guess it's not that big a deal. 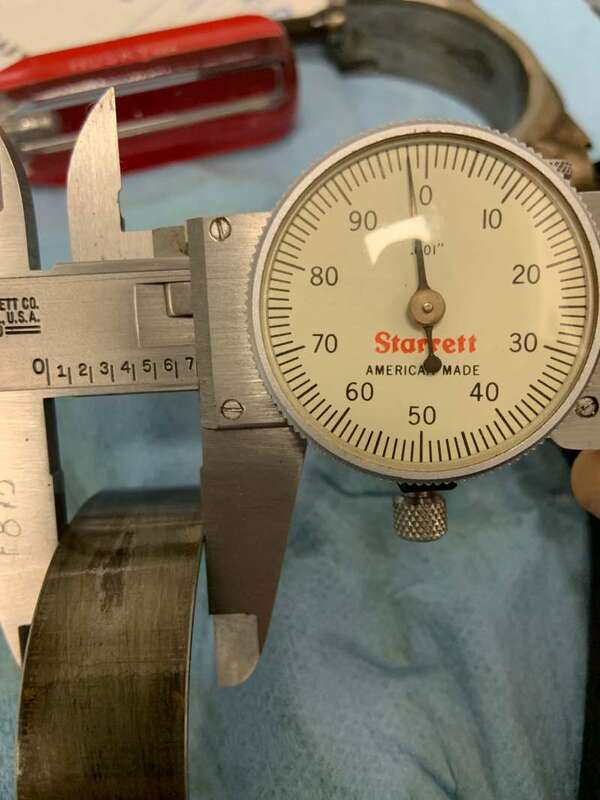 That's certainly an incorrect conclusion since we have rods that are capable of having good alignment with old bearings, and bad alignment with new bearings. 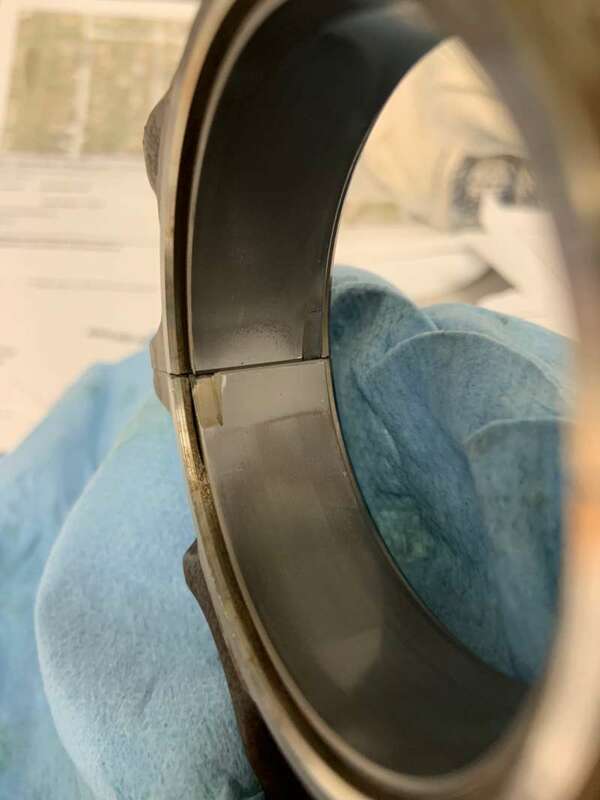 I think we would see that there is variance in the location of the tab, or probably more accurately the width of the tab in the bearing itself, pulling the shell too close to the outside edge. I was once told by a machinist that I trust that the rod bearing tabs are not actually all that important, they just help the assembler get the parts lined up, and then they are fully held in place by the fact that they are over sized compared to the big end, and are actually crushed in to place when the rod is clamped. He suggested that if the tabs didn't exist you could align it by hand and still have good result. I'd rather not do that, but it would be interesting to hear if Neil would have a problem with modifying the bearing tabs to encourage a more centered fit. I got thrown here by the original misalignment was listed for an 89 3.2L engine. I wondered how some were using GT3 bearings in these engines. I must have misunderstood something. Your machinist friend is absolutely correct. The Rod big end bore size clamps the bearing in place. 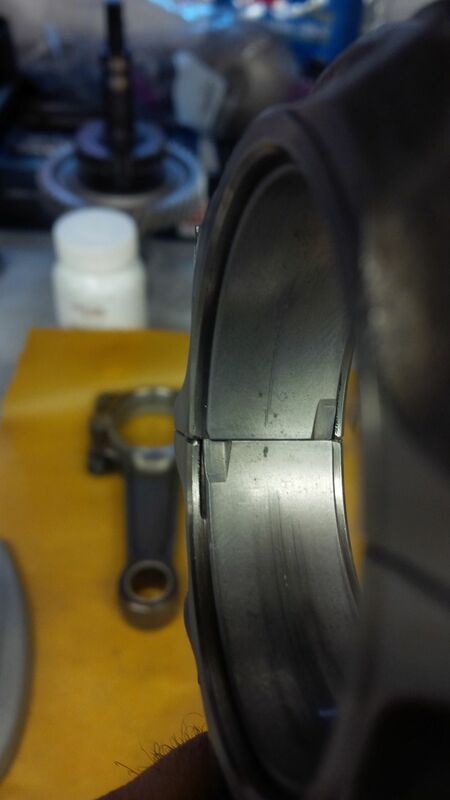 The bearings are not a perfect semi circle until they are fitted into the housing bores. The tangs are there for alignment in assembly. The only thing is to make sure when fitting the rods to the crank that the tangs are fitted in the direction of crank rotation. We are often narrowing the shell length and modifying the tang to fit the shells perfectly. There is no issue here. In fact, we modify the mains and the rod shells in these engines. Differently, but both are not fitted out of the box. Take a closer look at the shell and you will see that when the tang was broached into the shell, it not only went down but often went sideways some. This can push the shell into a very slight angle and the parting line of the other side will not line up as good as it should. It takes just a ting amount to remove the bit of the tang that protrudes sideways and the bearing will fit better. Do not modify the rod. The conclusion that all the bearings are the same width is now, AFAIK, fact. Although up for debate, I believe that the notches in my rods are "off" by a small amount (approx .5mm) and that's leading to the misalignment. 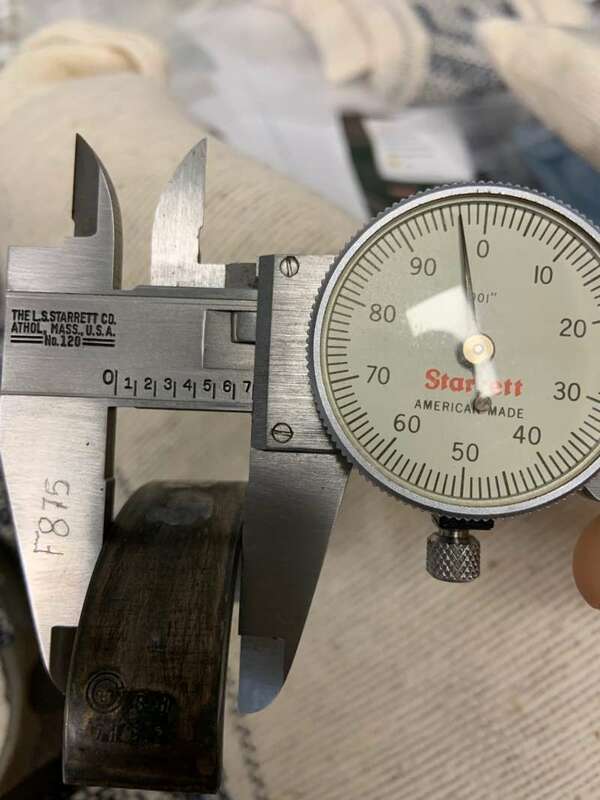 I don't think there's been an example of a rod with good alignment with one set, and bad with another - witness KTL's rod which has better alignment with all his bearings, old and new, and mine which is bad, old and new, and other examples in this thread. You are correct, as is Neil, that no, the tangs aren't that important, it's the crush that keeps thing in place after assembly. I also made the incorrect assumption that since the alignment of the edges was off, it must be a bearing width issue, and not a tang/notch placement issue. I'll take .5mm or so off each tang and leave my rods alone. One small point, it's not possible to orient the tangs for rotation on these rods, as the tangs are both on the same side of the rod. 1 notch on the rod, 1 on the cap, facing the same parting line. Thanks a bunch, Kevin! You've spent a lot of time on this topic that really may have turned out to be much ado about nothing. Oh well, if we lived in California we would be out driving, but what else is a snow belt dweller to do in the depth of winter. 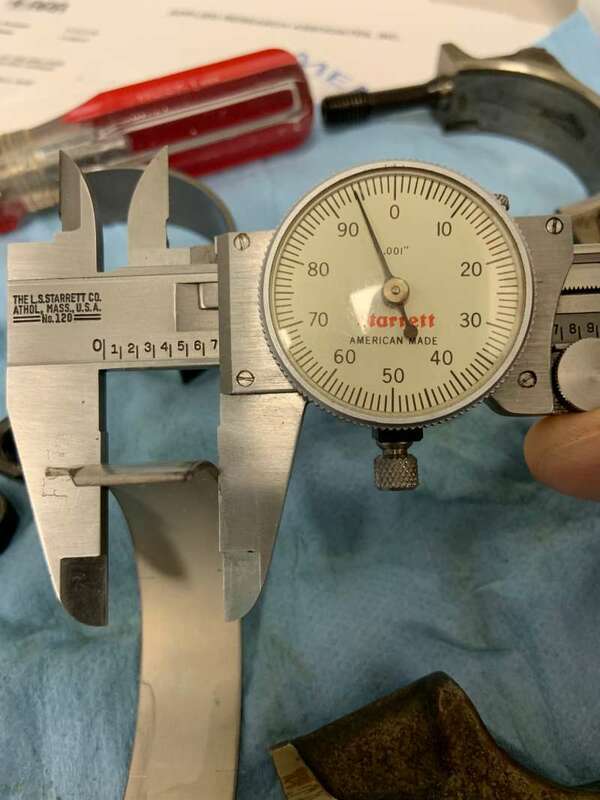 "As a note, I did go ahead and install the original bearings, and they line up perfectly. Never mind the scratches. they have been all floating around in a ziplock bag." 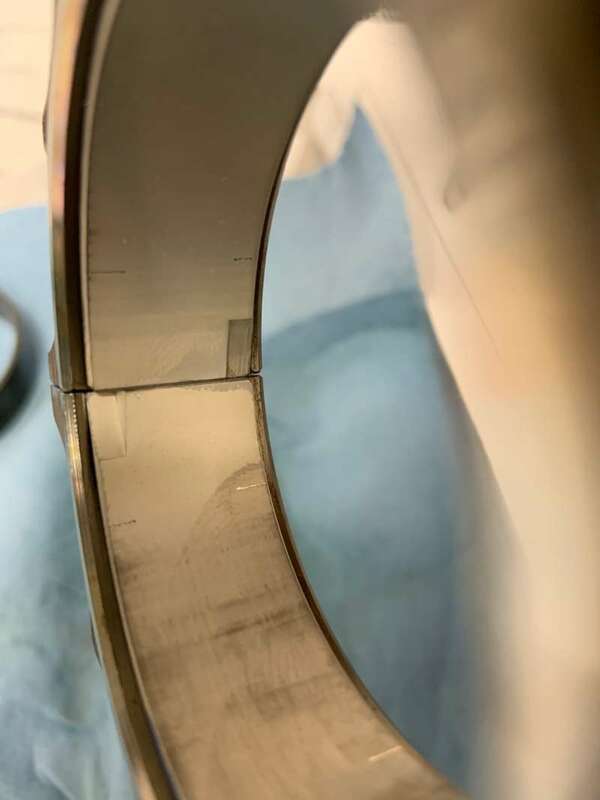 The OP has 3.2 Rods so not sure - we took this off the deep end into SC rod territory and has nothing to do with the original post. Never did hear back from him, however? Anyway, I took a file to a pair of my used bearing shells - a few minutes work took a bit off the inside edge of the tang (.5mm) alignment much improved. Original Poster here. Just to close out, I did end up returning the defective Glyco bearings to EBS and replaced with Clevite 77. 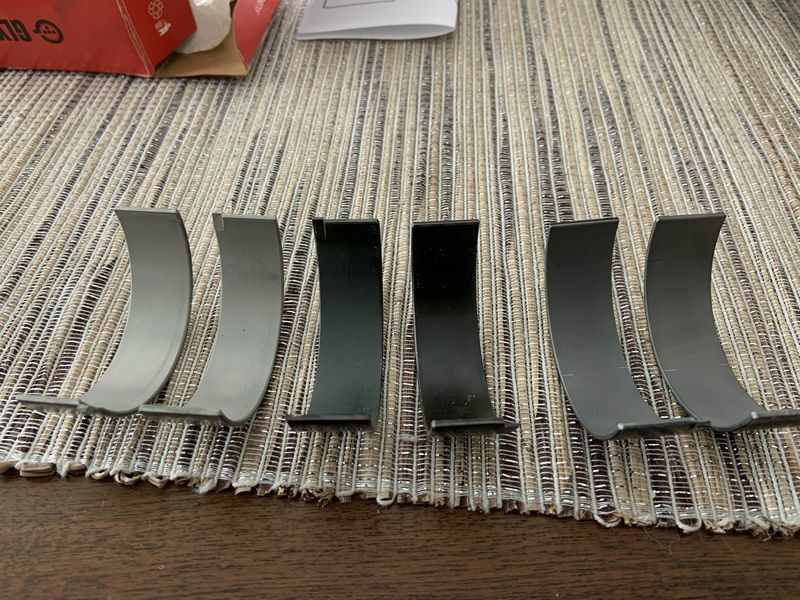 As suspected, they line up perfectly, and my BE Bores were highly repeatable with a bore gauge after assembly and torquing down. thanks to all for the thoughts, comments, and suggestions.